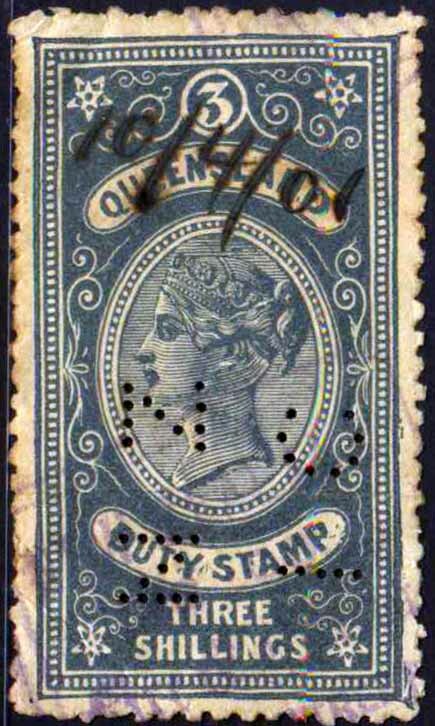 QV 1892 issue 1/-(blue), 2/6, 5/-, 10/-, £1. KEDVII 1d, 3d, 6d, 1/-, 2/-, 3/-, 5/-, 10/-, 20/-. KGV 1917 issue 1d, 5/-. 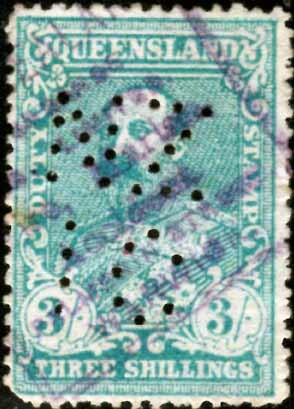 QV 1892 issue 1/-(blue) R2, 2/6 R3, 5/- R3, 10/- R4, £1 R4. KEDVII 1901 issue 1d R3, 3d R3, 6d R4, 1/- R3, 2/- R2, 3/- R4, 5/- R4, 10/- R4, 20/- R4. 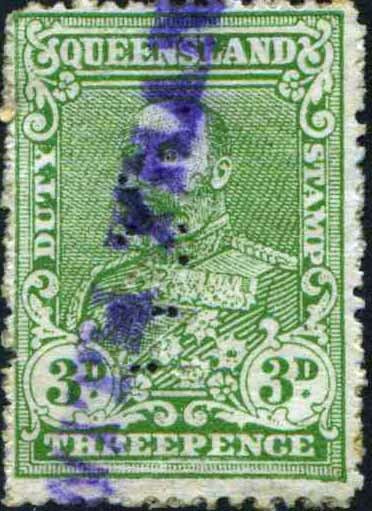 KGV 1917 issue 1d R4, 5/- R4. Background: *The National Fire and Marine Insurance Company of New Zealand was founded in Dunedin (NZ) in 1873. The Company expanded rapidly and opened offices in many overseas locations but by 1892 it had centred its interests in New Zealand, London, the Pacific Islands and the growing market in Australia. By 1908 the company had restructured and changed its name to the National Insurance Company of New Zealand. In 1961 it absorbed the failed Dunedin based Standard Insurance Company Ltd. In 1989 National Insurance was purchased by the Tower Corporation. Device: The N.I/Co.a device was most likely a single die device. The application and approval to use a perfin device dates from April/May 1901. Oddly this is some 7 years prior to the companies restructuring, and name change, but this may have been a lengthy process. 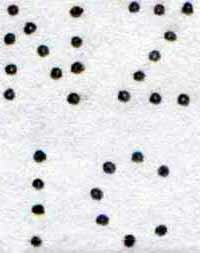 The pattern is found used on postage stamps as well as revenue stamps from 1901 until about 1915. Usage has been reported from as early as 1897 but this early usage is unlikely as it pre dates the application and is not supported by postmark evidence that we have seen. Late usage shows many missing pins in the C and O and it is likely that the device was retired at this point. User: New Zealand Insurance Co.
QV 1882 (side face state issue) 1d, 6d, 1/-, 2/-, 3/-. 1886 (1882 large Chalon state issue) 2/-, 5/-, 10/-, £1 (beer paper). QV 1892 issue 3d, 6d, 1/-(maroon), 1/-(blue), 2/-, 2/6d, 5/- 10/-, £1, £5. KEDVII 1902 & 1908 issues 1d, 2d, 3d, 6d, 1/-, 2/-, 3/- 5/-. KGV 1917 issue 8d, 1/-, 2/-, 5/-. 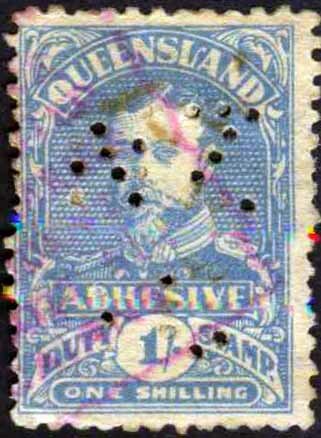 QV 1882 (side face state issue) 1d R2, 6d R4, 1/- R3, 2/- R2, 3/- R2. 1886 (1882 large Chalon state issue) 2/- R3, 5/- R2, 10/- R4, £1 (beer paper) R4. QV 1892 issue 3d R2, 6d R4, 1/-(maroon) R2, 1/-(blue) R1, 2/- R1, 2/6d R2, 5/- R1, 10/- R2, £1 R2, £5 R4. KEDVII 1902 & 1908 issues 1d R1, 2d R3, 3d R1, 6d R4, 1/- R2, 2/- R3, 3/- R4, 5/- R3. KGV 1917 issue 8d R5, 1/- R4, 2/- R4, 5/- R1. 1930 Numeral issue 1d R4. Background: *The New Zealand Insurance Company was founded in Auckland (NZ) in 1859 and was the first insurance company established in NZ. Its interests were mainly in marine and property insurance and as with other insurance companies of this time, they became involved in the establishment of the early fire brigades in major cities of NZ. The company expanded quickly and by the late 1880’s they had offices throughout New Zealand and Australia as well as London, India, Ceylon, Burma, Cape Colony (and later South Africa), Hong Kong, China, Japan, Argentina and the USA (San Francisco and Honolulu). In 1906 the company was restructured as The New Zealand Insurance Company Ltd and they continued to expand around the world and in Australia establishing offices in Maryborough and Townsville (1907), Rockhampton (1908) and later Cairns. After a series of mergers with other NZ based insurers in the 1980’s including fellow perfin user The Southern British Insurance Co. Ltd., the NZ Insurance group was acquired by General Accident Fire and Life Insurance Corporation in 1989. Following further takeovers and name changes it was eventually disposed of as a trading entity and struck off the New Zealand Register of Companies in 2001. #The company lodged many items of historical interest with Archives New Zealand in 1991 including the perforation device NZIC.a which was noted as being recovered from the Maryborough office. A detailed study of the NZ/IC and NZL pattern groups can be found at www.perfins.com.au under the Perfin Research tab. 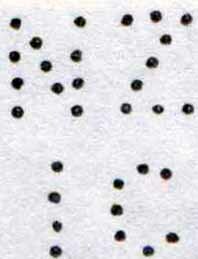 Device: This pattern with its characteristic full stops after each letter is the easiest of the NZ/IC group to identify. 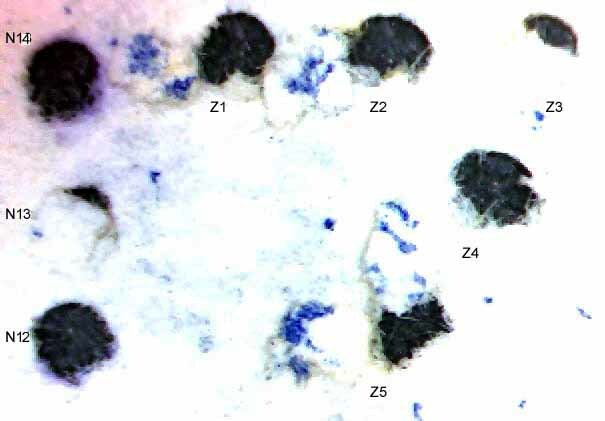 Samuel (2010) includes some great detail about it (see pages 73 and 74) including an image of the device and 2 specimen impressions of the pattern. The specimen strikes suggest that it is possible that it was a 2 die device, but if this is the case the dies are so similar as to be the same. I would doubt it is anything more than a single die device as it seems to be able to give good central strikes onto a wide variety of stamp issues of different sizes and this is much easier to achieve with a single die device. Further the separation shown on the specimen strikes is not consistent with the spacing of multiples strikes that we have seen. Further evidence to support a single die device is shown above where used as a cancelling device on an insurance document from Maryborough. The usage is widespread and we have seen postmarks and Company cancels from Rockhampton, Maryborough, Charters Towers, Townsville and Brisbane as well as usage on NSW revenues, which would suggest the device spent time in the company’s Sydney office. Much of this usage overlaps so the most likely explanation is that the device was located at a central office (Maryborough or Brisbane) and that perforated stamps were issued to user areas from this office. This is the method adopted by larger users such as State Governments. Alternatively the evidence of remote usage across Queensland as well as in Sydney in the same period could have been achieved by multiple devices with identical dies. However this is an early device (1880’s) and given the standards of manufacturer at this time it would have been a challenge to produce a series of identical dies. The pattern is found on postage stamps of Queensland and Australia and revenue stamps of Queensland and New South Wales between 1889-1934. 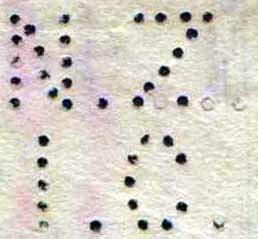 We have sighted later use of the device on Queensland revenue stamps up until 1945. This continued use on revenue stamps is often the case with perfin users who puncture both postage stamps. QV 1892 issue 3d(THREE PENCE), 6d, 1/-, 2/-, 3/-, 5/-, £1. KEDVII 1902 issue 1d, 2d, 3d, 1/-, 2/-. QV 3d [THREE PENCE], 6d R4, 1/- R4, 2/- R3 3/- R4, 5/- R3, £1 R4. 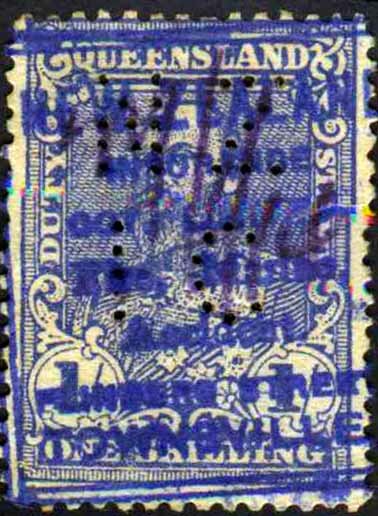 KEDVII 1902 issue 1d R2, 2d R2, 3d R4, 1/- R4, 2/- R4. Device: This pattern was used at both the Adelaide and Brisbane offices of New Zealand Insurance Company. Such device location changes are rare but this is the most likely explanation as the usages do not overlap. The alternate possibility of a double coincidence, that the Brisbane device went out of service at the precise time as a near identical device came into service in Adelaide, seems unlikely. The device was first used in Brisbane where you often see the pin in the cross bar of the N missing. The pins are quite fine and the missing pin may have been due to a breakage. It is only in this Brisbane usage that it is found on revenue stamps. It is most likely a single die device. In 1908 it moved to Adelaide but there seems to have been subtle changes to the device as the pattern from this point features slightly thicker pins and makes a clearer strike with the pin in the N always in evidence. It is possible that the device was refurbished prior to going into service in Adelaide. The top pin of the “I” is often missing in the Adelaide usage. However South Australian revenue use has not been reported. 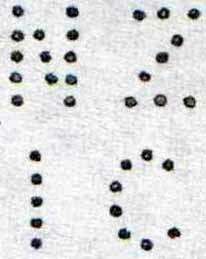 This pattern is found on revenue and postage stamps of Queensland and then postage stamps of South Australia and later, and less commonly, on Commonwealth issues until at least 1922. KEDVII 1908 issue 2d, 3d, 6d, 1/-, 2/-, 2/6d, 3/-, 5/-, 10/-. 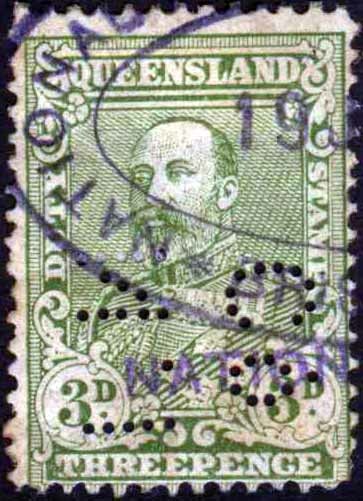 QV 1892 issue 2/- R1. KEDVII 1908 issue 2d R4, 3d R4, 6d R4, 1/- R3, 2/- R4, 2/6d, 3/- R4, 5/- R4, 10/- R3. Device: This pattern has been reported as a Brisbane pattern but this is unlikely as the readable postmark and company cachets we have seen are all Townsville strikes. It is most likely a single die device. 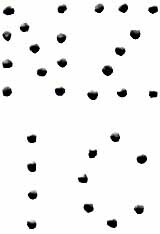 It is similar to some other NZ/IC patterns but this pattern is characterised by a taller “C” of 8 pins where the similar patterns .d, .e and .f all have 7 pin C’s. 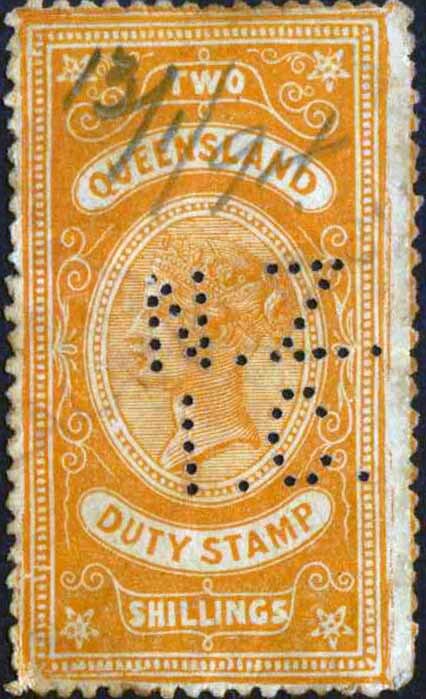 It is found used on revenue stamps of Queensland but also on postage stamps of both Queensland and those of the early Commonwealth period with usage from the late 1890’s until 1919. Revenue Use: KEDVII 2/-, 3/-.KEDVI. Rarity Scale: KEDVII 2/- R3, 3/- R4. Device: This is a single die device that was located at the Company’s Toowoomba office. It is characterised by a rather bent “I”. In basic structure and scale it is similar to the NZ/IC patterns .c, .e and .f but they are different devices and each has their own individual pattern characteristics. 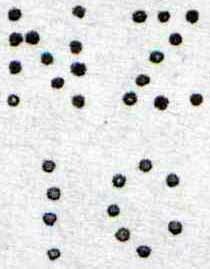 This pattern image has not been listed in other publications as it was regarded as a variation (“type”) of the pattern we list as NZ/IC.f. Such listings of visually similar patterns with remote usage as “types” of the same pattern only serves to confuse the study of a pattern group such as NZIC. It is found on postage stamps of Australia as well as Queensland revenue stamps between 1913-1930. KEDVII 1d, 6d, 1/-, 20/-. KGV 1920 issue 1d, 2d, 1/-, 3/-. KEDVII 1d R4, 6d R4, 1/- R4. KGV 1920 issue 1d R4, 2d R2, 1/- R4, 3/- R4, 20/- R4. 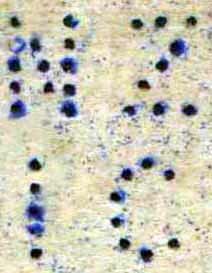 Device: This is the pattern from a single die device located in the Cairns office. 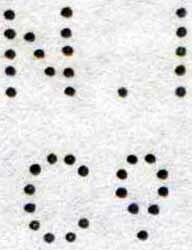 The pattern is characterised by a very straight backed “C”. The company history does not state the date of the establishment of the Cairns office but it would most likely have been after the Townsville office (1907). This is supported by evidence of the pattern on Edward VII revenue issues. The pattern is rare and early usage seems to be only on revenues, starting around 1910, but it is later found on Australian postage stamps around 1929. KEDVII 1908 issue 2d, 2/-, 10/-. 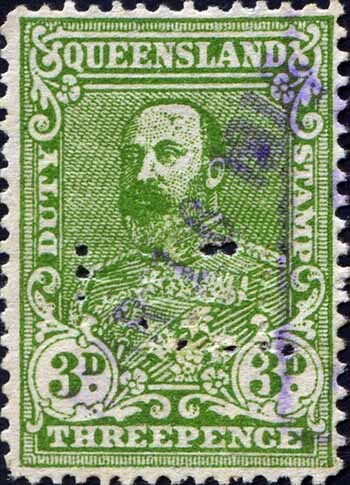 KEDVII 1908 issue 2d R4, 2/- R4, 10/- R4. Device: Another single die device, rather similar to NZ/IC.d, but with a straighter “I”. This device was located at the Brisbane office. The pattern is mainly found on postage stamps and revenue use is quite rare. 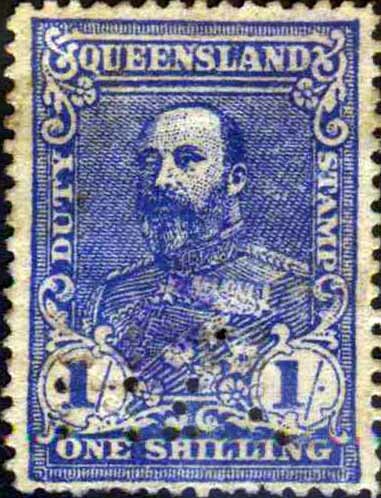 It is found on postage stamps of the Commonwealth period (between 1913 and 1920+) and on revenue stamps of Queensland in around the same period. 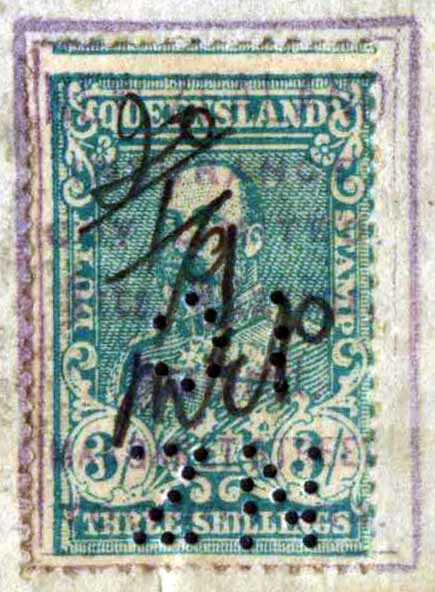 KEDVII 1908 issue 3/- R4. The pattern is mainly found on postage stamps and revenue use is rare. It is found on postage stamps of the Commonwealth period. User: New Zealand Loan & Mercantile Agency Co. Ltd. Wool & Produce Brokers, livestock & Property Salesmen, Shipping, Customs, forwarding, Insurance Agents & Merchants. Address: Quay St, Rockhampton, QLD. Revenue Use: KEDVII 1908 issue 3d, 1/-. Rarity Scale: KEDVII 1908 issue 3d R4, 1/- R4. Background: The New Zealand Loan and Mercantile Agency Company Limited was originally incorporated in London in early 1865, and commenced business that year as a produce, financial, and general commercial agents, with their head office in Auckland. It originally planned to confine its operations to New Zealand but decided to extend business to Australia in 1874. Operations were soon established in various Australian States including offices in Melbourne, Sydney, Adelaide, Brisbane, and Rockhampton. In July 1893 as a result of market falls and particularly the financial crisis in Australia, the Company suspended operations with a view to reconstruction this took place in 1894. The company extended its operations from finance into stock and station agency and wool and produce brokers. NZL & MA merged with Dalgety & Co Ltd in Nov 1961 to form Dalgety & New Zealand Loan Ltd.
Device: NZL.a was was a single die device located in the companies Rockhampton office and is only found on the issues of Queensland. It is most likely to be the device that was the subject of the Company’s March 1906 application and subsequent approval to use a perforating device. 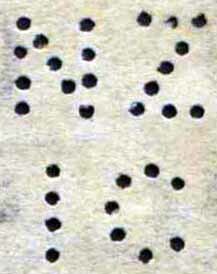 Late usage is characterised by many blind pins and it is clear that by about 1910 the device was no longer sound. It was replaced in 1912 by the NZL.b device. Given the similarity in scale and size of the NZL.a and .c patterns it is possible that this NZL.a device is actually the parent device to the later Brisbane NZL.c device. NZL.a and .c are certainly very similar in size and scale but in the .a pattern the top pin of the Z is slightly higher than the nearby top pin of the N. In the NZL.c pattern the relationship is reversed. 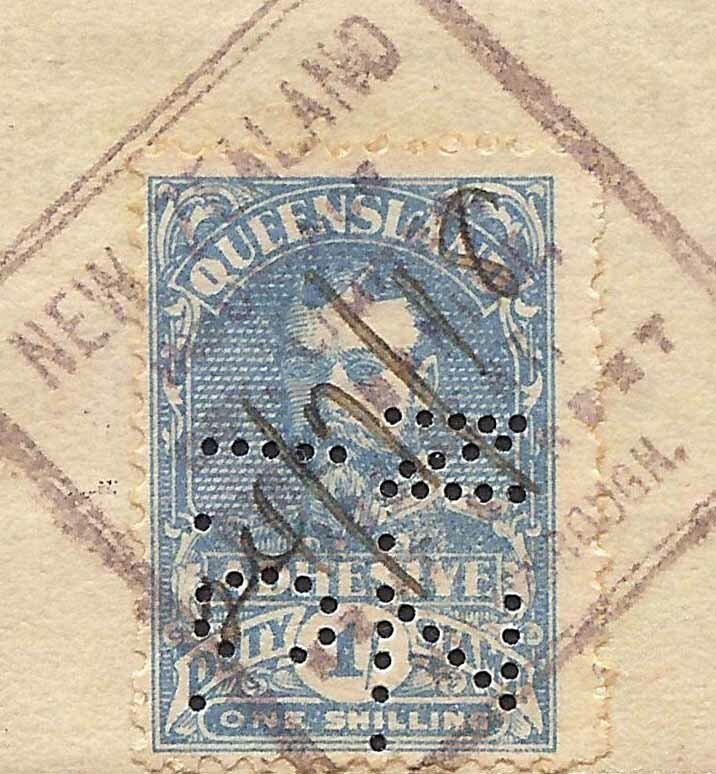 NZL.a is found on postage stamps and revenue stamps of Queensland between 1906 and 1911. KEDVII 1908 issue 3d, 1/-. KEDVII 1908 issue 3d R2, 1/- R2. 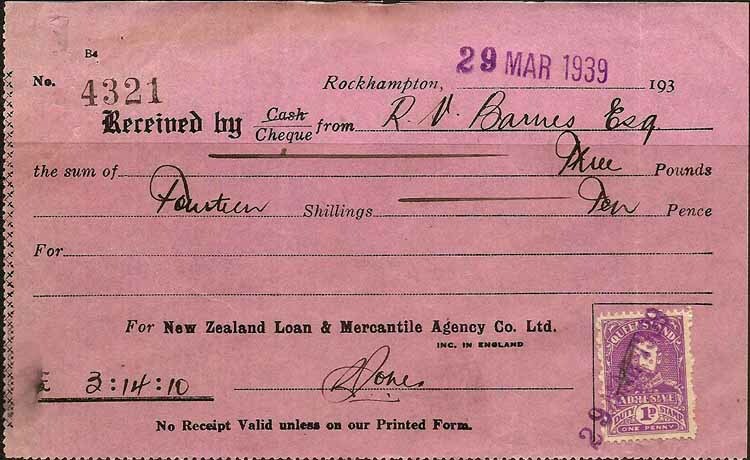 Device: NZL.b is another single dies device and was most likely located in the Rockhampton as a replacement for the NZL.a device. 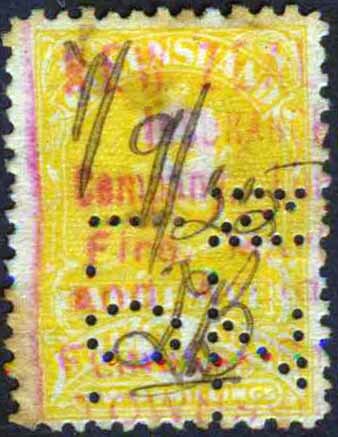 On postage stamps Rockhampton postmarks predominate as well as those of near by Blackall and Longreach. The NZL.b pattern is similar in scale to the NZL.a and .c device but in .b the letters are more uniform. The pattern is fairly consistent over its long life but in about 1932 it alters slightly. This is noticeable in the change to the shape of the base of the L. In pre 1932 usage the base is generally straight but with the centre pin slightly below the other pins. In the post 1932 usage the last pin of the base of the L is lower. 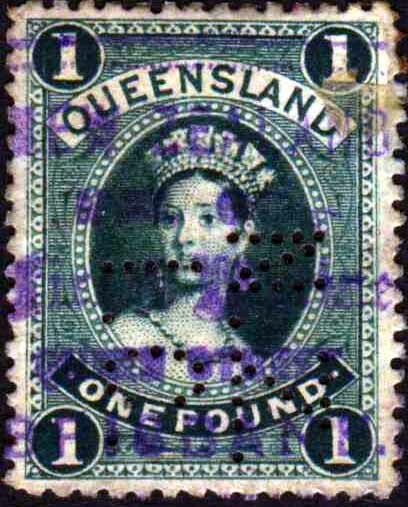 The early variety is found on postage stamps of Queensland and Australia as well as Queensland revenue stamps. 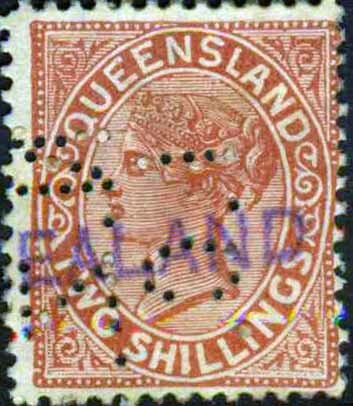 The later type is found on postage stamps of Australia and Queensland revenue stamps. Given that both patterns are found in the same location and the difference is small the variation is most likely the result of a minor repair to the device. A detailed study of the NZ/IC and NZL pattern groups can be found at perfins.com.au under the Perfin Research tab. QLD (Wool & Produce Brokers, livestock and Property Salesmen, Shipping, Customs, forwarding and Insurance Agents & Merchants). Rarity Scale: KEDVII 1908 issue 3d R2, 1/- R2. Device: NZL.c is a single die device located in Brisbane and it was only in service for a short time in the early Commonwealth period. 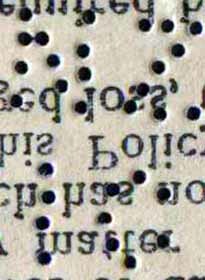 The device was apparently not very robust as there is evidence of missing pins in the base of the L in early (1913) usage. It is remarkably similar to NZL.a and indeed it is possible that the patterns originate from a single device that was altered or repaired. 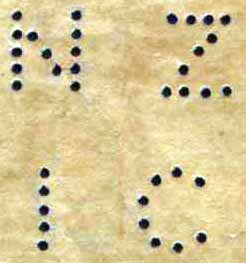 You can tell an NZL.a and .c apart as the top left hand pin of the Z in .a is slightly higher than the nearby right hand top pin of the N. In .c the relationship is reversed and the top pin of the Z is slightly lower than the top pin of the N.
This pattern is found on postage stamps of Australia and revenue stamps of Queensland around 1913-1914.